I’ve always been a huge fan of the classic Big Muff. I guess it’s the one effect I can’t live without. Not only because of David Gilmour’s tones but all the different models over the years each with a distinct tone of its own. Wouldn’t it be great to have all those models in one pedal? Big Tone Music Brewery did just that with the Royal Beaver so naturally I had to check it out! Big Tone Music Brewery is Build Your Own Clone’s sister company. The idea with BTMB is to take the BYOC concept further and not only make clones of old classics but develop the designs and create new effects and pedals based on the guitarists’ demands. The Royal Beaver (RB) is their first and the latest addition to the ever growing Big Muff family. The RB is housed in an Electro Harmonix XO-ish sized box with a bright purple led, true bypass switching and it operates on a 9V battery or adaptor. The right side of the pedal feature the familiar volume, tone and gain controls and an additional 4-way EQ switch (similar to the EH Big Muff Tone Wicker) switching between scooped (classic Big Muff tones), flat, mids (mid range boost) and none (bypassing the tone control). The left side of the pedal feature controls for three clipping stages – two for classic Muff tones and a third for further tone experimentation. Each clipping stage is switched on/off with individual mini toggle switched for different combinations. See the BTMB site for more technical info (fear notâ€¦ the pedal comes with a user manual). For this review I did an A/B test for each of the RB’s Big Muff models. All pedals were tested with a Stratocaster loaded with Fender CS69/Duncan SSL5 pickups into a Reeves Custom 50w amp with a 4×12″ Sound City cab with Weber Thames speakers. The RB can produce two different Triangle era Muffs (late 60s/ early 70s). I don’t own an original EH Triangle my self so I tested the RB against a BYOC Large Beaver (3-knob Triangle clone). I’ve always preferred the Triangle Muff. Its warm tone, violin-like sustain and smooth attack makes it the most musical of the Muffs. I was a bit surprised though that none of the RBs sounded quite like the LB, which after all is designed by the same company and based on the same pedal. RB’s Version 1 has a bit more gain while Version 2 seems to have less gain and appears slightly darker. Still, Version 1 works better on it’s own than the LB, which I rarely use without an overdrive behind it. This clip is done with a Fender Stratocaster with a Seymour Duncan SSL5 bridge pickup with the Royal Beaver and a Boss DD2 into a Laney Cub 15w tube head with a 2×12″ 100w cab. The Royal Beaver is set up for a classic Ram’s Head tone. The problem with old EH pedals is that none are identical so it’s hard to judge the sound by just one pedal. I’m proud to own an original ’73 Ram’s Head but it might be quite different to the one used as a basis for the RB. The RB is a lot more quiet than the ’73 (I’d be surprised if it wasn’tâ€¦). The ’73 has a brighter tone closer to David’s Animals sounds, while the RB is smoother like David’s Wall tones (David apparently used the same pedal for both Animals and Wall though). I do miss the ability to make the RB sound really dirty but some fine tweaking on the clipping controls helps. All in all, the RB has a much smoother tone, a super tight lower end and a more dynamic attack compared to the ’73, which is what I’m looking for in a Muff. Just add an Electric Mistress and book your next gig! Winner: Royal Beaver (although not tested against a 70’s NYC). The very first Muff I bought was a green Sovtek around 1996-97. I still have it. There aren’t many clones of this particular model and the ones I’ve tried doesn’t quite match my old beast. The RB sounds unmistakably like an early Sovtek with the familiar growling lower end and endless sustain. Compared to the other Muffs this one has a lot more gain. Still, it doesn’t quite make it. I miss some of that nastiness and feeling of total mayhem when you engage the pedal. The RB sound more like a shiny Cornish P2 than a viscous green tank from the cold war (which isn’t a bad thing but not quite what I expected). What I like about the RB is it’s versatility. Using only one clipping stage produce a warm overdrive (similar to the new EH Germanium 4 BM) with a dynamic response ideal for humbuckers. Two clipping stages produce those classic Big Muff tones and by fine tweaking the volt, gain and bias controls you can add whatever you feel is missing to each Muff model. Engaging the third clipping stage adds a whole new range of sounds with endless sustain and tons of screaming fuzz. One of my favourites is to set the pedal up for a Ram’s Head and set the EQ switch for None bypassing the tone control adding a slight volume boost and an extreme punch. $329 is perhaps a bit steep for a pedal but then again, this isn’t your average clone. The Royal Beaver has made it to my stage board and also ended up being my main distortion for all my leads on the new Airbag album that we’re working on. It’s always great fun to discover new pedals that exceeds your expectations and the Royal Beaver certainly did just that for me. Being a huge BYOC fan I’m perhaps a bit biased but I’m anxiously looking forward to new exciting stuff from BTMB! 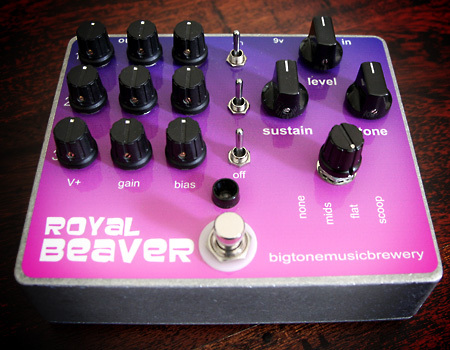 Visit Big Tone Music Brewery for more info about the Royal Beaver. Hey Bjorn, I like what you did with this review. But I wanted to ask you something. Did you think this pedal would be good for bass guitar? It seems very versatile, and I used to have a Green Russian bubble on my board. But I have also liked the sounds of the other variants. Here I am again. I own the Royal Beaver and am very happy with it. Have you got any good settings to make it sound like a Civil War Muff ala Pulse? hey if i get a channel switcher , can i have all of the different channels go into one amp? and if so what channel switcher do u recommend? aLSO where did you get your gollmer composus from? where can i get this thing from and for what price? in the review what settings did you use (aprox.)? You are so right about this pedal, Bjorn! I just purchased one and the variety and quality of tones you can get are very gratifying. The pedal is pricey, but it’s well worth the cost in my opinion. Regarding the number of knobs, there’s really no reason for anyone to complain or worry. The instruction manual tells you exactly how to set up each Big Muff version as well as presets for some other cool variations. If you take the time to set up and play with all those variations, you’ll become well aquainted with the pedal and will able to come up with all kinds of your own variations. Be willing to explore and experiment and you won’t be disappointed. I must note that I absolutely love this site, Bjorn. It’s played a large role in getting me to play again, and for that I sincerely thank you. Keep up the good work! Was wondering, I know that the adapter needs to be standard 9VDC negative 2.1mm tip. Is Boss adapters compatable for this pedal? Great Demo ! I recently bought the Royal Beaver and have The Laney Cub combo, love them both. Was just wondering if the Royal Beaver was set to the manuals exact setup for the tri-muff or if you set anything different. Plus was also wondering what you had your amp settings at. Any help would be greatly appreciated! TY. I love this website! Has anyone tried out the Lionheart series from Laney Amps? I’m looking at either the L20H or L50H and want to know if they have the same sound as the Cub. Any help is greatly appreciated! Hey man. I am always in a search of great pedals and one of my favorite ones are from AnalogMan. After this review though, I think that this is my all time favorite BigMuff or even just general OD pedal. Your tone and playing is truly great and you are my friend the real knight in the search of all Holy Grails. I love PF but want to and really must cover little bit more ground, speaking of tone vise. This is my first message on this great webpage, but I wanted to thank you so much for the amazing tips for amps and pedals you did review. Laney is part of my setup for smaller places now and it is one of my favorites in amps. And this mind blowing pedal is so so so great and I discovered it only because of you!!! I am in debt to you my friend. I liked my Xotic, Butler Tube Driver and AnalogMan for boost and OD but this is my top of the list of pedals to go for an great tone. BTW, if you want good deals a mod pedals from all kinds of brands, go to BuyAnalogMan.com, where they sell everything that is good. Thank you again for your research. I know, what it takes. One more thing, a huge thank you Bjorn for this amazing website! Keep up the great work. Bought one of these from Scott (axeandyoushallreceive.com). Fantastic pedal. Ran a Strat directly into the pedal and output straight into a JCM900. Very quiet with tons of sustain. You’d be hard-pressed to find anything close to matching it in this price range. If you’re on the fence about whether or not to get one, don’t be. You will not be disappointed. It’s Gilmour in a box! Buy and enjoy. Absolutely wonderful and articulate website on David Gilmour. This clearly takes tons of love, passion and hard work. I have not tried the Royal Beaver quite honestly. But I never thought anything would knock my BYOC Triangle off my board until I discovered the Tri/Ram by Basic Audio. It is swtichable between Ram’s Head and Triangle and has a wonderful mids control that let’s you tailor it the exact sweet spot. It can do it all and is the same size as the BYOC. He even socketed the transistors at my request in the event I ever wanted to experiment with different trannies, but have had zero need to do so as it sound wonderful. I’ve spent tons of hard earned money on muffs over the years. The search is over. The Tri/Ram is king to my ears. For anyone wanting both those classic Wall Ram’s Head tones or the clarity of of the Triangle in a small footprint, look no further. Thank you for all what you do and taking the time , would you be kind to send me a shot of the green muff that you like soo much , you got me really interested . I have a P-2 and a JAM red muck pedals to name a few ( by the way the red much is a killer muff , check it out ) I want to locate one of these green old muffs , so your help is greatly appreciated . Managed to pick up a 2nd hand Royal Beaver on Ebay. Great sound by itself, without the necessity for a booster. I thought the top three V+, Gain, and Bias Potentiometers on mine, had slightly sloppy shafts, when compared to the rest. Also, as they were making a ‘swishy’ sound when adjusting, so I decided to replace them with tighter shaft pots. Didn’t change the ‘swishy’ sound much, so just the nature of the pedal which is acceptable as it will probably stay on the same settings mostly. Must admit it’s super quiet when compared to the old BYOC Triangle Large Beaver I was previously using. Still dead silent with the sustain on max., at moderate levels. It just sings, without the woolly low end I was getting from the Beaver. Do you personally still add the Tube driver or Coloursound, or just prefer to leave it without? Would you say that the Royal Beaver has the same sound as the Large Beaver with Ram’s head specs ? And did you check by any chance the Jam Pedals “Red Muck” yet ? Seems like a pretty awesome muff clone. Thank you so much for this website. It is amazing! I just have a question for you. How do you have your Laney EQ’d? Thanks Bjorn, for the review and specially the vid. Well, I’ll probably soon find out by myself… but I’m wondering if the pedal can also be set to go in a Fuzz Face direction or to get a Ratty touch… Have you already tried to tweak it like that? I loved your review of the Royal Beaver. I agree with a previous poster who complained of too many knobs. It takes real patience to find the tone you want, but you have done it. It also makes me want to learn that solo. Can you recommend an accurate tab for it? The ones I’ve found on the web seem to vary wildly in their approach. Thanks. [The Royal Beaver comes with a detailed manual with accurate settings for the clipping stages. All you really need to do is to dial in the desired model and then concentrate on the usual 3-knobs gain, volume and tone. Couldn’t be any easier really. Bjorn, the tone of pedal with the amp which sounded great, was only surpassed by your stellar playing ! Which leads me to ask you this: I know you are a busy guy, but have you ever thought of offering downloadable lessons for a fee on the site and if so perhaps a link on You Tube when you upload videos there ? The extra income wouldn’t hurt, and the lessons would really help the guys out there that are like me – can’t quite figure out how to play a song or it’s close, but not quite right. Sure there are a limited free You Tube videos out there, but most of them do not come close to your precision and dedicated efforts. Allright, I’ll buy my own freakin’ power adapter for it – this pedal rocks! By far the best and most versatile fuzz I’ve ever played -sustain on it is nuts! Thanks for the good review and good tip! Just got mine in the mail – purchase based entirely on the tone in your video! Serial number 17! Haven’t plugged it in yet but it looks quality, although for the price I would have really, really dug getting a power supply with it! How did you find out about B.Y.O.C.’s other company and this pedal? If it wasn’t for you and this website,I wouldn’t have half of the gear that I do now! By the way,I am a long time Laney user and enthusiast! I own one Laney GH 50L with 2 Laney 4×12″Cabs and one Laney GH 100L with a Marshall JCM 900 Lead 1960A 4×12″Cab and a Marshall JCM 900 Lead 1960 B 4×12″Cab and I absolutely LOVE them! They are all tube, of course, and sound absolutely wonderful. I play mostly Strats which sound great in their own way and I have just one Gibson Les Paul Std. which makes those amps “Bloom” into lovely breakup. I think that they sound very unique and highly recommend them to your readers! By the way, We’re all proud of you for having a band, (as we all do), but maybe more actual Floyd Youtube clips instead of Airbag? After all this is a Gilmour-ish website. (With all due respect). Oh- you MUST check out this website!!! Hey Bjorn a nice review as usual,obviously if its made an appearence on your site it is obviously up to the job but if its made its way onto your board it must be a bit special.How have yoy found it in producing that lovely creamy smooth CWM Division Bell Pulsey type tone using the 69s ssl5 pickups not the EMGs.Sounds like a really versatile interestng addition to the board and lets be honest,the thought of a nice purple LED would only enhance the cool look of any pedal board :)sory for that comment but who woldnt agree with that hehe. Fantastic in-depth review and killer video!! I own Axeandyoushallreceive.com and we build the pre-built pedals for BYOC. I also retail the Big tone Music Brewery pedals up in Canada. Keith from Big tone/BYOC mentioned to me that alot of people in the EU were interested in getting a Royal Beaver and he suggested that I should maybe drop a quick post here. I ship quite a lot of stuff to EU on a daily basis and we have slightly better trackable int’l shipping rates to EU etc. I have them in stock ready to ship. If anyone wants one, please just drop me an email (scott@axeandyoushallreceive.com) with your shipping address. I was just thinking of all the changes you’ve made to your board and amp since the last “My Gear” update. I’d love to see the most recent product when you get a chance! Fantastic as always! Hello bjorn!!! I think this comment it is not on the right place but I need some explication. You have said that david Hiwatt custom 100 is never cranked because if it was we could hear on his delays and that kind of stuff…. so if we are thinking on buying a hiwatt custom 100 or 50 it is the same thing we will just get more volume with the custom 100(because the amp in never cranked). I am right? [The reason for whether an amp will distort or not lies in all the parts in your rig. Hiwatts are designed to have lot of headroom but it can also distort quite easily if you crank the master. In combination with a 200w cabinet, like David’s WEMs the amp is less likely to distort. A Marshall however is designed to have less headroom and a Celestion loaded speaker cabinet will help you achieve that classic rock tone. So it’s the combination of both the amp, its settings and the specs on the cabinet. In addition, David’s using low output pickups while a Les Paul with hot humbuckers will make the amp distort more easily. David usually sets the amp on the sweetspot between clean and overdrive right on the edge of its peak. This produce as very poweful clean tone and the amp’s tubes will interact more with the pedals. I had planned on on getting one of these as soon as I saw its several months ago, not that I need another Big Muff – but I can’t help myself :) Now I’m sure to get one. I hate the purple graphics on the Royal, but it is the sound that matters. Interesting that the Triangle settings do not precisely match the Large Beaver tri. I wonder if it is the same with the Ram’s Head setting vs. the LB Ram’s head version? Looking forward to your info about the Laney Cub 15w. Great review as usual Bjorn ! Thanks for your work and reviews. This royal beaver seems to be very interesting. I’m really happy with my BYOC LB (triangle) and my Pig Mine which should be more close to the ram’s head version. Did you try it ? It gives great results with my gear, and doesn’t need a booster to give it best. One question, you usually use the Colorsound or another boost pedal the kick the Muff into “Gilmoure-mode”, did you not use a boost pedal for this demo or is the Laney already overdriven from its own gain knob? old question… what about the “mojo”? Interesting review again Bjorn. Seems like this pedal gives you enough settings to find the right sound. But I’m afraid that I have to explain something at home when my wife finds out that I ordered a royal beaver ;-). Yet another great review, of yet another great pedal. It’s certainly useful having a website like this to help keep track of them. The only thing that i thought was a bit weird was the numbering system – it’s called a cub 12 but it has 15 watts! Not that i’m complaining. I’m hoping to start a band soon so the option to use a speaker cab with it could come in handy. Anyway enough of my waffling. Cheers for the review and cheers for the site, its been a great help. I want to get a decent overdrive pedal, and your site is a lot more helpful than most of the sites i’ve looked at. It’s nice to have the advice and opinion of someone who plays in a proper band, even if i do most of my playing in my bedroom, but hey, we’ve all got to start somewhere! Thanks for the tip bjorn. I was looking at the laney a week or two ago and i really fancy it considering the price. Â£206 for the head and Â£140 for the cab, what a steal! I also wish to point out the fact that i am very annoyed at you for making me want the royal beaver sooo much after watching this demo, I’m in the process of “flogging” my old gear to save for it, however I’ll be keeping my trusty b.y.o.c too ! I saw your u-tube vid and thought that this was just the best muff I ever heard. Then I saw you review and thought you had lost your mind. 24 hours later I’ve had the chance to study the controls and get my mind around whats going on there. I have to say I’m impressed, the Royal is a well thought out pedal. If I can ever scrape up $329 for a pedal this just might take the Darkside (P-2 clone) off of my board. I think you have to see this site. This is a guy in Greece who makes great pedals. all vintage sounding. These pedals are very hot worldwide right now. Check the red muck (russian civilwar clone) is fantastic. Great review again! It seems like a great pedal. I’m actually surprised it got onto your gig-board! Great review as always Bjorn. The price is a bit steep compared to a vintage Muff I think but it looks like a great toy to play with. Cant wait for a review of the cub. That looks like a nice little amp to have in the collection. Great job Bjorn. The Laney sounds pretty sweet. You’ll have to share more about that later. I want one of these pedals now. Damn it!! Hopefully you’ll get to check out a SUF soon. Sounds like a good pedal, I do agree with Carlo….too many knobs. But I’m sure after about a week it shows itself as a very useful and versatile pedal. Awesome review! Bjorn, when you do In The Flesh do you have an overdrive behind the Triangle muff? That’s some pedal Bjorn. I now regret buying the triangle version and wish i’d held off and went for the royal beaver. It looks and sounds beautiful. Obviously your playing contributes greatly to that. A couple of queries though, my triangle byoc doesnt really have alot of gain, or volume, i have it cranked and have used it through valve ampsbut i need the compressor and the blues driver to get it to work? and also, would you recommend the laney for a “first” valve amp? sorry to be a pain, keep up the awesome work. [The triangle is much milder than the other Muffs. That’s what makes it sound so good but it does have a bit less gain and it needs to bee boosted quite a lot. You don’t have to use a compressor and an overdrive to make it work but it helps to bring out a bit more bite and volume. The Ram’s Head stands better alone. [Thanks! The demo is recorded with the mic on my iMac and the Beaver alone so the tone isn’t all fair. Sounds ten times better with the volume cranked and the Tube Driver behind it. I usually stay clear of pedals with more than four knobs on it but this thing is just amazing. You can dial in any Muff and anything in between. The Laney is a great little 15w stack ideal for playing at home. Of course it doesn’t perform as well as a 50w Hiwatt or Reeves but then again it’s only 15w. Eats any pedal for breakfast but I usually just place a DD2 in the efx loop and play with mildly cranked tubes. The 1w power scaling works remarkably well. Review coming soon! Too much controls… in this time I prefer the simple pedals. This Royal Beaver is good sounding, but too complicated!